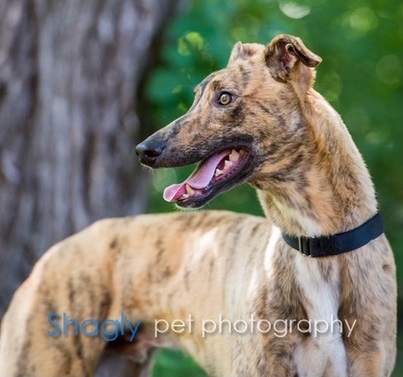 Gibbs is a 9-month-old brindle male. His sire is P's Gibbs and his dam is MRL Off Limits. Gibbs was born with a toe missing from one of his hind legs, and so was not deemed fit to race. He often hops instead of using the leg with the missing toe, but x-rays show no injury and he does not seem to be in any pain. 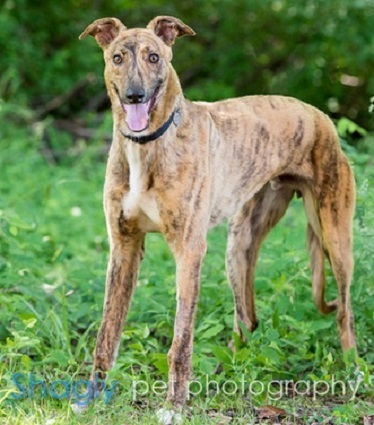 Gibbs has passed an initial cat test and is living in a foster home with cats.